This past Saturday I went up to Boston to race in the Head of the Charles, the world’s largest regatta, with over 300,000 spectators (a very rare thing in the small world of rowing). It’s always a spectacle as many of the world’s most famous current and past rowers travel in to compete in a variety of club, alumni, and championship boats. It was a beautiful fall day, the best weather I can ever recall for the race on Saturday, and short sleeve shirts were a must. I was racing for Ever Green Boat Club, the Dartmouth Alumni virtual club that pulls in alums of all ages and from all areas of the country. I was honored to make it into the non-Masters Alumni Eights event, which has become a very “stacked” event in the last couple of years, meaning that schools were pulling in recent Olympians and very recent grads to make the fastest possible boats. How did I prepare? By scaling back significantly on CrossFit and focusing on high-volume, high-intensity on-water rowing in small boats, balanced with technical skillwork for recovery. The only CrossFit I did was some basic strength work (squats and deadlifts) and core/shoulder work to make sure my body was ready for a maximal intensity 15-20 minute piece with the asymmetrical sweep rowing stresses that my body was not used to (being primarily a sculler). Why do I say “high-volume, high-intensity?” Because the prep for this level of racing requires executing approximately 600 power strokes at 32-34 strokes per minute, which is far more high-intensity volume than most CrossFit Endurance interval workout prescribe. The prep work paid off – although I am sore all over and in weird places, I was able to handle the asymmetrical load well. In addition, by preparing in small boats where a 5K race would take 18-22 minutes at a very heavy load per stroke, it was completely manageable for me to handle a 15:52 race with much lighter load in an eight, which is a much faster boat with an overall smaller amount of blade surface area in the water. I was the 2nd smallest guy in the boat, rowing in bow seat, where it’s important to row with impeccable technique more than awesome power, as you have a lot of influence over keeping the boat on an even keel and helping out with steering by giving less or extra power at the direction of the coxswain. In typical Head of the Charles fashion, we got into a 3-4 boat abreast battle halfway through the race which lasted to the end. That made it hard to get boat swing as we were constantly battling steering, wakes, and narrow bridge passages. It was nevertheless a very strong race, and we finished 15th, guaranteeing our entry for next year. If anyone wants to see what the race was like, there is a video on RowingRelated of the Michigan Alumni eight, who was in our race and finished fourth, about 45 seconds faster than our boat. The man in the frame is Tom Peszek, who is a 2012 Olympian. They took a video of the entire race, and you can get a sense of what it’s like passing other boats and going through the numerous narrow bridges, with thousands of people cheering from the banks and from above you on the bridge pathways. It will take me a week to recover, but it was a blast, and has totally motivated me to not only drive hard on overall training but to dive back into CrossFit to prep myself for indoor training in a few weeks. 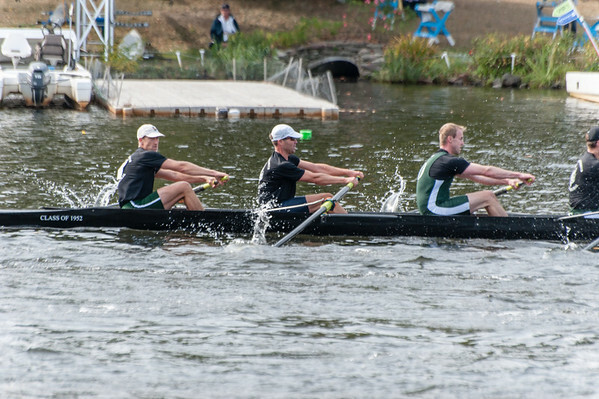 ← Head of the Charles Regatta This Weekend!